Wow - Love the look of that Nic! Great pictures too! Wow! That looks fantastic! Great use of berries, Nic! Heaven in a glass. What is beautiful creation...must have been divine to eat. great use of meringues... light and summery! Looks delicious. I saw good old Gordon create this - balsamic v and strawberries is an amazing combo! I was already planning to make meringue cookies today and, now that you mention it, I have lots of fruit on hand. Not strawberries, but sweet local raspberries and blueberries. While I can't try the balsamic/strawberry combo, I'm sure there is something quite tasty that will come from your inspiration. Thanks! This does sound like something I should give a go Nic!!!!!!!!! i must admit that my world stopped when i saw your photos...this strawberry dessert is indeed glorious!! i love it! This is quite possibly one of the more exciting things I've seen lately. I always love the combination of strawberries and balsamic. This whole treat really approaches unfamiliar territory for me. 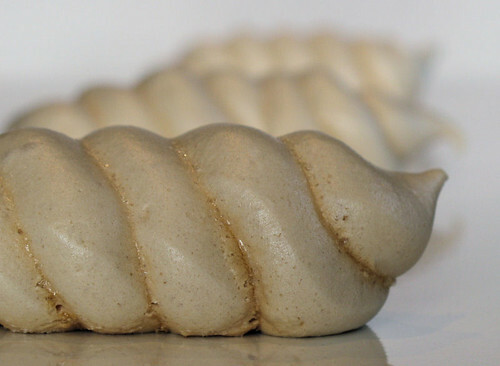 I've never made meringues.. but one of these days I'll give it a shot and I'll have to come back to this post to try this. Collywolly - I know what you mean about buying fruit out of season! For the shape, pile the meringue mixture into a piping bag, hold it horizontally (rather than vertically) and as you pipe onto the sheet, swirl you hand in small circles. Raquel - thank you, I love most berries. Nina - it was very tasty! Beth - I quite like some of the desserts that Gordon makes, and yes - it's a great combo! Lisa - mmmm... I love raspberries and blueberries too. Grace - not tried that combo? Get to it girl, you'll love it!! LyB - You could always do them in a pan on the cooker, rather than turn on the oven. Dhanggit - thank you so much! Cookinpanda - thanks, and I hope you do give meringues a go, you can make loads of great desserts with them. Holy Moly! That looks phenomenally good! I can't believe I saw this before lunch. Egg salad doesn't sound so good anymore after seeing this! Oh WOW that looks awesome. Balsamic and strawberries go so well together, don't they? I never thought of frying strawberries before but I can see how that would intensify the flavor. The flavor meter must be off the dial! love the swirl in the meringue! I would have a hard time crushing them when they are so pretty. Looks like perfect weather fpr some Strawberry Glory! How decadent and stunning. Strawberry Glory is the perfect name for this dish. Wow, Nic. I'm speechless - I love the way the layers go together! And the flavor must be amazing, too. balsamic and strawberries are a combo I wouldn't have ever thought would work. Seeing all the comments perhaps I will have to give this a go. Great photos Nic! Wow so many flavors and textures in this dessert, my kind of dessert! Perfect! Dear Nic, the top photo of the meringue is a killer, it's so beautiful! 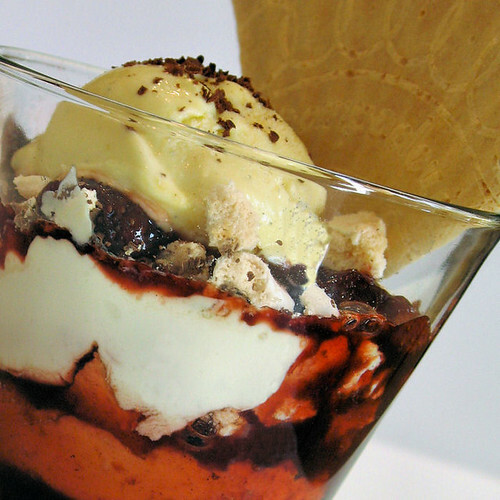 And how refreshing does your dessert look! 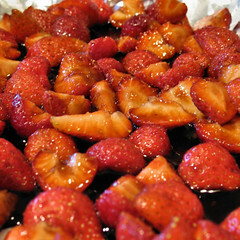 Strawberries and balsamic vinegar indeed sound great, I'll have to try it sometime. Sticky - eww, I can't stand eggs! Brilynn - thanks for posting the recipe! Annie & Nate - thanks so much and thanks for visiting! Megan - I crushed up the duff ones, ssshhhh! Dragon - thank you and that is a great name, wish I had made it up! Sue - you should give that combo ago, but use good balsamic! Robin Sue - thank you! Miri - thank you my friend! Shreya - thank you and welcome to my blog! Katie - thank you and welcome to you too! This is a truly glorious dessert, Nicisme! Everything from the name to the airy meringue to tangy balsamic vinegar is making me happy! Thanks for the entry to SHF! Fantastic...the flavours are to die for! Lovely entry for both events Nic! How could you crush those beautiful meringues! The strawberry glory looks amazing. So many beautiful pictures on your blog.. Love the meringue closeup. Glory indeed! And great minds must think alike - wait till you see my entry for snackshots ;-) And I didn't even see the GR show - I just had some cherries & meringue that needed eating... Wonderful pics, as usual. I love layering yogurt, strawberries and balsamic syrup. But this is just perfectly decadent with the meringue! Goodness, that looks so fantastic! 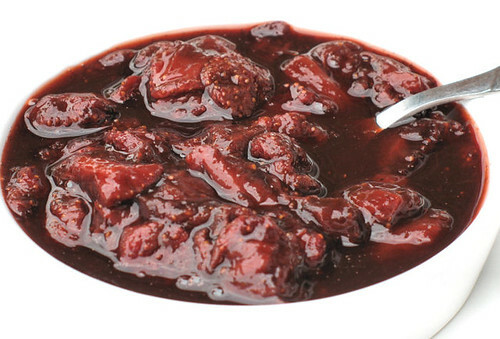 I tried the stawberry/balsamic combination for the first time recently and was delighted with the result - so delicious. Roasting the strawbs sounds like a good idea and one that I must try. This looks so delightful: awesome contrast in texture! Susan - thanks for a great round-up! Margaret - you gotta do what you gotta do...! Jude - welcome and thanks so much! Tartlette - I must try it with the yoghurt! Antonia - thank you and do try the roasting thing! Ann - come on, you are way behind the times girl! CollyWolly - you're welcome and good luck with your house move! Alexa - welcome and thanks for the comment! Jeanne - yours look fabulous, got any to spare as mine have vanished? !